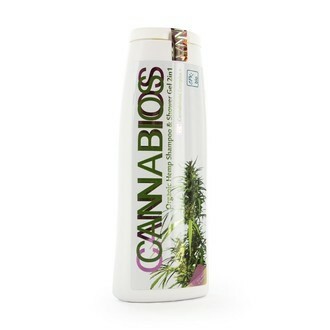 The CBD Shampoo Shower Gel by Cannabis is a 2 in 1 shampoo and shower gel with soothing, nurturing and moisturizing qualities. This hair and body care product restores the natural pH of the skin and soothes body and scalp. It even helps in reducing symptoms of an irritated or itchy scalp. The CBD Shampoo Shower Gel by Cannabios is a CBD-rich hair and body care product with soothing, nourishing and moisturizing qualities. This 2 in 1 shampoo and shower gel is perfectly suited for the daily hygiene of people with sensitive skin or with an allergic predisposition. It restores the natural pH of the skin and soothes the body and scalp. It even helps in reducing symptoms of an itchy or irritated scalp. The CBD obtained from organically grown Cannabis Sativa, olive oil, extracts of honeysuckle, lavender, lemon, rosemary and coconut create a natural lipid barrier which protects the skin from harmful environmental influences. With a pH lower than 5.5, this hair and body care product does not affect the natural acidity of the skin. This product is free from harmful chemicals and THC, contains no irritating ingredients and is not tested on animals.